The Donner Party traveled from the western edge of the Great Salt Desert (near the present Utah-Nevada border) to Marys River (now the Humboldt River) where they re-jointed the the more established California Trail (at present Hunting Siding, Nevada). The dated entries below are from the diary of Hiram Miller and James F. Reed. The Diary is controversial to some historians. The existence of the diary was not known until the estate of Martha (Patty) Reed donated it to Sutters Fort Historical Museum in 1945. Apparently neither Virginia nor Patty revealed the diary to McGlashan. Virginia apparently did not use it as a source for her Century Magazine article in 1891. Some of the entries appear to have been written after the events, which led both Stewart and King to question it. King went so far as to suggest that some entries may have been written after Reed arrived in California, which seems unlikely. The Trail left the Gray Back Hills, and crossed the salt flats towards Floating Island at the north end of the Silver Island Mountains, passing Floating Island on the north, and crossing a low pass (now called Donner-Reed Pass) between the Silver Island Mountains and Crater Island Range. They saw themselves, their wagons, their teams, and the dogs with them, in very many places, while crossing this plain, repeated many times in all the distinctness and vividness of life. Mr. Eddy informed me that he was surprised to see twenty men all walking in the same direction in which he was traveling. They all stopped at the same time, and the motions of their bodies corresponded. At length he was astounded with the discovery that they were men whose features and dress were like his own, and that they were imitating his own motions. When he stood still, they stood still, and when he advanced, they did so also. ... Subsequently he saw the caravan repeated in the same extraordinary and startling manner. Modern travelers can see this same phenomena as they drive along Interstate 80. If they look north across the salt flats, they can see what appears to be cars and trucks driving on a road through the desert parallel to the Interstate. The construction of the dike at the south end of the Newfoundland Evaporation Basin has reduced the areas where travelers on the highway can see out into the salt flats. James Reed edited his step-daughters letter before she mailed it, and provided the following details. The men who stayed with the family were Walter Herron & Bailos and those who drove the cattle were boys Milt Elliot & J Smith. Most emigrants were forced to leave their wagons on the desert and drive their cattle to water before they gave out. James Mathers, who crossed with the Harlan-Young party under the guidance of Lansford Hastings two weeks before the Donners, wrote in his diary: 16th Started on the long drive and after traveling until near the middle of the next day without resting but a little we were obliged to leave two waggons and go on with the third so as to get the cattle to water the sooner, the distance still being more than 20 m.
at about ten oclock A.M. of the [third day], Mr. Eddy and some others succeeded, after leaving his wagons twenty miles back, in getting getting his team across the Great Salt Plains, to a beautiful spring at the foot of a mountain on the west side of the plain, and distance about eighty miles from their [last] camp.... On the evening ..., just at dark, Mr. Reed came up to them, and informed them that his wagons and those of Messrs. Donner had been left about forty miles in the rear, and that the drivers were trying to bring the cattle forward to water. After remaining about an hour, he started back to meet the drivers with the cattle, and to get his family. Mr. Eddy accompanied him back five miles, with a bucket of water for and ox of his that had become exhausted, in consequence of thirst, and had lain down. We started to cross the desert traveling day and night only stopping to feed and water our teams as long as water and grass lasted. We must have made at least two-thirds of the way across when a great portion of the cattle showed signs of giving out. Here the company requested me to ride on and find the water and report. Before leaving I requested my principal teamster, that when my cattle became so exhausted that they could not proceed further with the wagons, to turn them out and drive them on the road after me until they reached the water, but the teamster misunderstanding unyoked them when they first showed symptoms of giving out, starting on with them for the water. I found the water about twenty miles from where I left the company and started on my return. About eleven oclock at night, I met my teamsters with all my cattle and horses. I cautioned them particularly to keep the cattle on the road, for that as soon as they would scent the water they would break for it. I proceeded on and reached my family and wagons. Some time after leaving the man one of the horses gave out and while they were striving to get it along, the cattle scented the water and started for it. And when they started with the horses, the cattle were out of sight, they could not find them, or their trail, as they told me afterward. The Trail ended at the springs at the base of the prominent Pilot Peak. These springs are now called Donner Spring, and are located on the Stephens ranch about 25 miles north of Wendover, Nevada. Can I ever forget that night in the desert, when we walked mile after mile in the darkness, every step seeming to be the very last we could take? Suddenly all fatigue was banished by fear: through the night came a swift rushing sound of one of the young steers crazed by thirst and apparently bent upon our destruction. My father, holding his youngest child in his arms and keeping us all close behind him, drew his pistol, but finally the maddened beast turned and dashed off into the darkness. I staid with my family and wagons the next day, expecting every hour the return of some of my young men with water, and the information of the arrival of the cattle at the water. Owing to the mistake of the teamsters in turning the cattle out so soon the other wagons had drove miles past mine and dropped their wagons along the road, as their cattle gave out, and some few of them reaching water with their wagons. Receiving no information and the water being nearly exhausted, in the evening I started on foot with my family to reach the water. In the course of the night the children became exhausted. I stopped, spread a blanket and laid them down covering them with shawls. In a short time a cold hurricane commenced blowing; the children soon complained of the cold. Having four dogs with us I had them lie down with the children outside the covers. They were then kept warm. Mrs. Reed and myself sitting to the windward helped shelter them from the storm. Very soon one of the dogs jumped up and started out barking, the others following making an attack on something approaching us. Very soon I got sight of an animal making directly for us; the dogs seizing it changed its course, and when passing I discovered it to be one of my young steers. In cautiously stating that it was mad, in a moment my wife and children started to their feet scattering like quail, and it was some minutes before I could quiet camp; there was no more complaining of being tired or sleepy the balance of the night. We arrived about daylight at the wagons of Jacob Donner, and the next in advance of me, whose cattle having given out, had been driven to water. Here I first learned of the loss of my cattle, it being the second day after they had started for the water. Leaving my family with Mrs. Donner, I reached the encampment. Many of the people were out hunting cattle, some of them had got their teams together and were going back into the desert for their wagons. Among them was Mr. Jacob Donner, who kindly brought my family along with his own to the encampment. We remained here for days hunting cattle, some of the party finding all, others a portion, all having enough to haul their wagons except for myself. On the next day or day following, while I was out hunting my cattle, two Indians came to the camp, and by signs gave the company to understand that there were so many head of cattle out, corroborating the number still missing; .... The next morning, in company with young Mr. Graves--he kindly volunteering--I started in the direction the Indians had taken; after hunting this day and the following, remaining out during the night, we returned unsuccessful, not finding a trace of the cattle. Reed was wrong about being the only one who couldnt retrieve his wagons. As noted by Thornton, from Eddys recollection: George Donner had lost one wagon. Kiesburg also lost a wagon. I now gave up all hope of finding them and turned my attention to making arrangements for proceeding on my journey. In the desert were my [three] wagons; all the team remaining was an ox and a cow. There was no alternative but to leave everything but provisions, bedding and clothing. These were placed in the wagon that had been used for my family. I made a cache of everything else. On the afternoon ... they started back with Mr. Reed and Mr. Graves, for the wagons of the Messrs. Donner and Reed; and brought them up with horses and mules, on the evening ....One of Mr. Reeds wagons was brought to camp; and two, with all they contained, were buried in the plain. We realized that our wagons must be abandoned. The company kindly let us have two yoke of oxen, so with our ox and cow yoked together we could bring one wagon, but, alas! not the one which seemed so much like a home to us, and in which grandma had died. Some of the company went back with papa and assisted him in cacheing everything that could not be packed in one wagon. 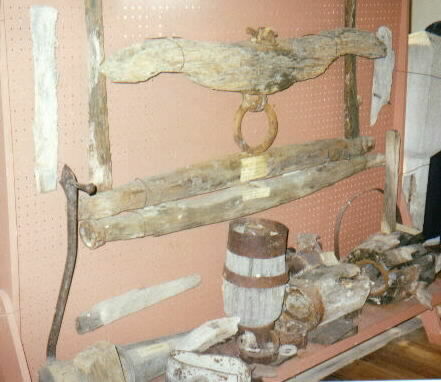 A cache was made by digging a hole in the ground, in which a box or the bed of a wagon was placed. Articles to be buried were packed into this box, covered with boards, and the earth thrown in upn them, and thus they were hidden from sight. Thus were created two Donner Party myths. First, the myth that the wagons were buried. It should have always been doubted that the party members, after crossing the desert, would have had the time, the strength or the inclination to dig holes in the desert. 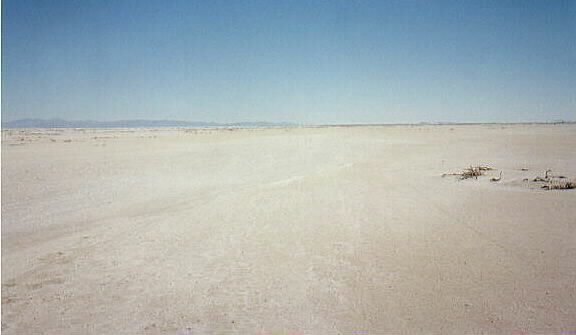 Besides, later travelers reported the wagons standing on the salt plain. We passed during the night 4 wagons and one cart, with innumerable articles of clothing, tools chests trunks books & yokes, chains, & some half dozen dead oxen. 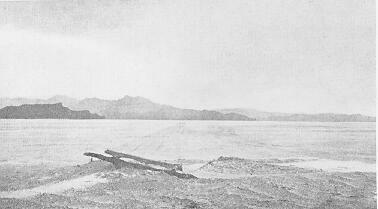 Encamped on the wet sand & had for wood part of an ox yoke and the remains of a barrel & part of an old wagon bed. 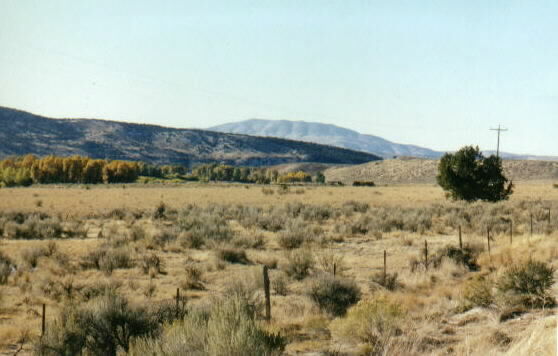 Grantsville, Utah, ranchers Dan Hunt, Quince Knowlton and Steven Worthington passed the sites in about 1875, and reported that the wagons had fallen down and were collecting mounds of sand. After the publication of McGlashans articles and book in 1878-80, and Virginia Reeds articles in 1891, these observations were ignored and the myth took hold. It was somewhat reinforced by Charles Kellys expeditions to the sites beginning in 1929. Kelly found an empty wagon box under a sand dune, which led some people to conclude that the wagon had been buried, even though Kelly himself wrote that you could not dig a hole in the mudflats deeper than 8 inches because it would fill with salt water. The 1986 Hill Air Force Base expedition, reported by Hawkins and Madsen, excavated five sites, and found no evidence of burial. But Reed himself wrote in 1871, he was able to bring in the wagon that had been used for my family. 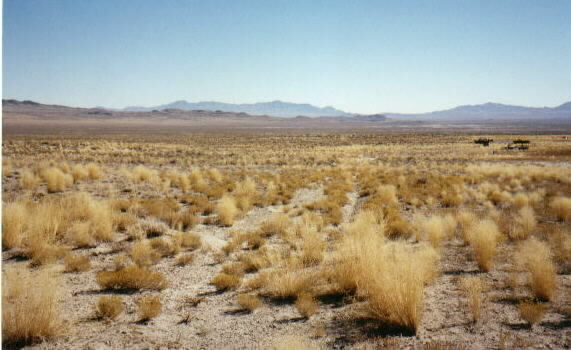 Reeds memory was proven correct in 1986 when the Hill Air Force Base archaeologists found wagon tracks in the desert playa, and measured all the tracks at about 58 to 59 wide, except for one set of 86 wide tracks. The wider tracks do not end in a pile of wagon remnants, but pass by such a pile, confirming that Reed drove the Pioneer Palace Car past the abandoned wagons to salvage what provisions he could. Sadly, we will never be able to learn anything more from these sites. Most of the second half of the the dry drive, about 25 miles from Interstate 80 to the Silver Island Mountains, is now submerged under the Newfoundland Evaporation Basin created in 1988 by the State of Utahs West Desert Pumping Project. This project was designed to prevent the flooding of the developed areas around the Great Salt Lake caused by the periodic fluctuations in the lake level. 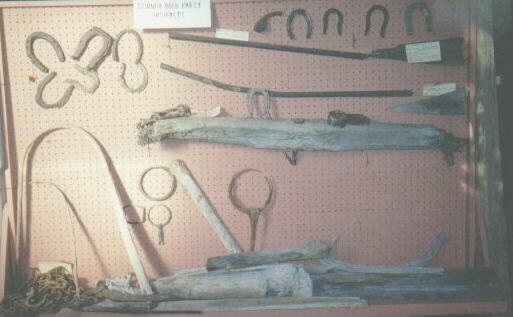 Fortunately, some of the artifacts recovered during the early expeditions are on display at the Donner-Reed Museum in Grantsville, Utah, and at the Donner Memorial State Park Museum in Truckee, California. Unfortunately, many other artifacts were recovered from the sites only to be lost years later. After we got across, we laid by one or two days to recruit; but, when we were ready to start, Mr. R.s last yoke of cattle were missing; so, all hands turned out, and made a general search for six days, but we found no trace of them. 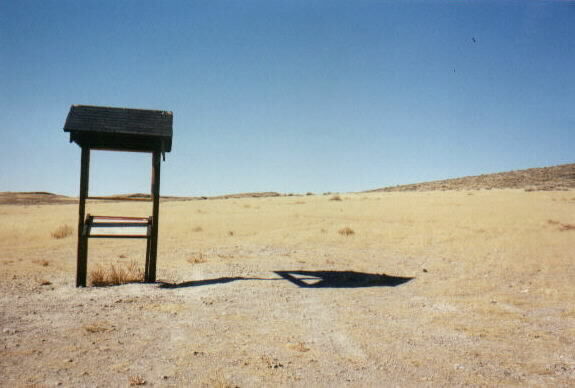 In fact, it was impossible to find cattle on those plains, as the mirage, when the sun shone, would make every object the size of a mans hat look as large as an ox, at the distance of a mile or more; so one could ramble all day from one of these delusions to another, till he became almost heart-broken from disappointment, and famished from thirst. In all likelihood, Breen was wrong about searching for one yoke. The party probably was searching for the nine yokes lost by Reeds teamsters during the dry drive on September 2. Reeds diary entry again refers to the family waggon contradicting Virginias 1891 memoir that the Pioneer Palace Car was buried in the Salt Desert. Reeds difficulty traveling was commented upon by John Breen, as recorded in Eliza Farnhams 1856 book California, In-doors and Out : One man lost all his oxen but one yoke, and was, consequently, compelled to leave all his wagons but one, into which he put a large family and their provisions, which, of course, made traveling very tedious. I divided my provisions with those who were nearly out, and indeed some of them were in need. I had now to make arrangement for sufficient team to haul that one wagon; one of the company kindly loaned me a yoke of cattle, and with the ox and cow I had, made two yoke. We remained at this camp from first to last, if my memory is right, seven days. Apparently, Reed did not remember, and did not refer to his diary entry, that more than one member of the Party lent oxen to him. Our provisions were divided among the company. 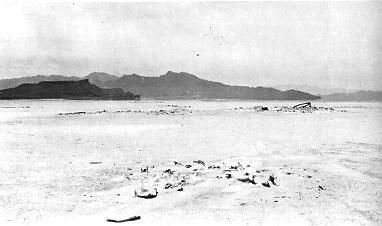 Before leaving the desert camp, an inventory of provisions on hand was taken, and it was found that the supply was not sufficient to last us through to California, and as if to render the situation more terrible, a storm came on during the night and the hill-tops became white with snow. 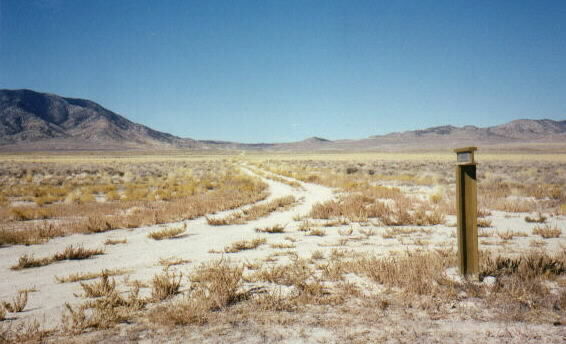 The Trail followed the faint wagon tracks left by the Bidwell-Bartleson Party in 1841, when they became the first party to bring wagons across the Salt Desert, north of the Great Salt Lake. The Trail went southwesterly around the base of Pilot Peak and over a low pass now called Bidwell Pass, named in honor of the first party to bring wagons through Utah in 1841. 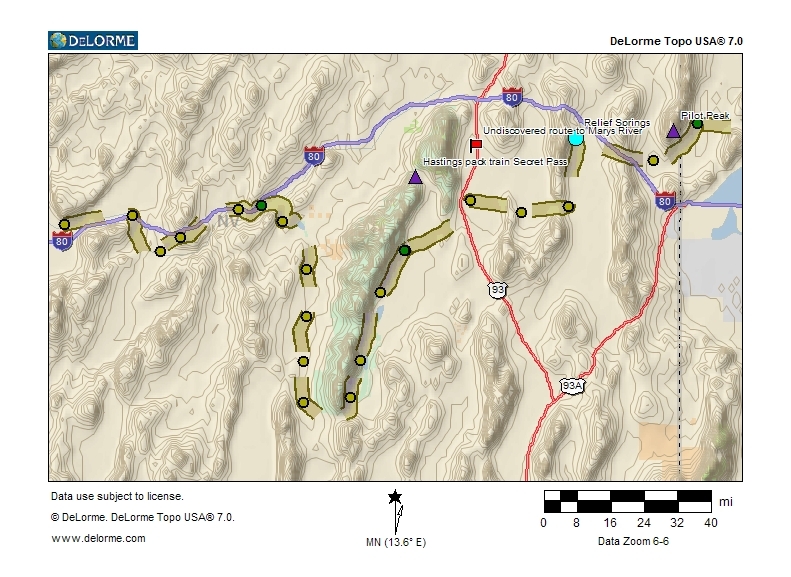 The Donner Party probably camped along Pilot Creek towards present Silver Zone Pass, northwest of Wendover, Nevada. ... on the morning of their leaving the long encampment at the desert, there appeared a considerable fall of snow on the neighboring hills. The apprehension of delay from this cause, and of scarcity, made the mothers tremble. Here was another day and night dry drive, over Silver Zone Pass. In another example of Reed updating his diary after the fact, he records the arrival at the next camp under the date of the 11th, when actually they traveled the entire day. Although Reed wrote of the campsite in his diary entry of the 11th, the actual arrival was on the 12th, after driving all night. 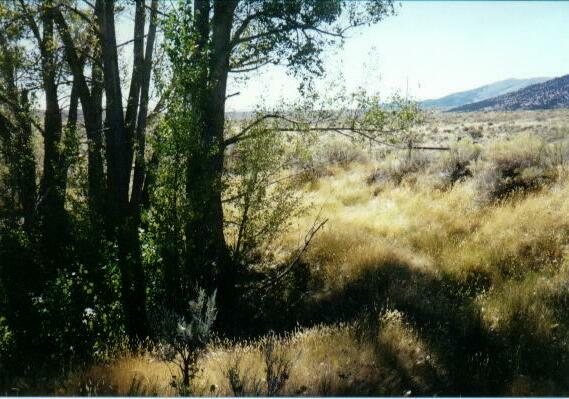 The camp was at present Big Springs Ranch, in a valley on the east side of the Pequop Mountains, south of Oasis, Nevada. T.H. Jefferson on his 1846 map called this camp Relief Springs, the location of Chiles Cache. 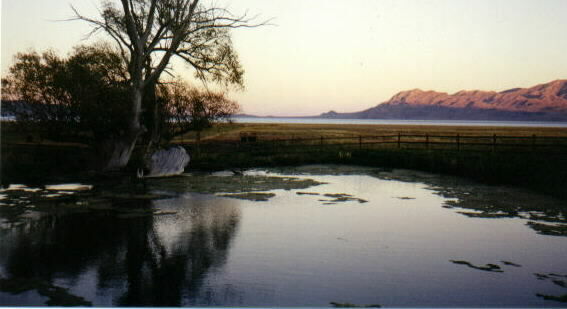 Chiles had guided the Bidwell-Bartleson Party in 1841 from the Bear River around the north shore of the Great Salt Lake to this campsite where they abandoned their wagons and continued by pack train to California. they arrived at water and grass, some of their cattle having perished, and the teams which survived being in a very enfeebled condition. Here the most of the little property of which Mr. Reed still had, was buried, or cached, together with that of others. .... Here, Mr. Eddy, proposed putting his team to Mr. Reeds wagon, and letting Mr. Pike have his wagon, so that the three families could be taken on. This was done. McKinstry probably obtained this account from John Sutter, who spoke to Stanton and McCutcheon. it became known that some families had not enough of provisions remaining to supply them through; as a member of the company, I advised them to make an estimate of provisions on hand and what amount each family would need to take them through. After receiving the estimate of each family, on paper, I then suggested that if two gentlemen of the company would volunteer to go in advance to Captain Sutters (near Sacramento), in California, I would write a letter to him for the whole amount of provisions that were wanted, and also stating that I would become personally responsible to him for the amount. I suggested that from the generous nature of Captain Sutter he would send them. Mr. McCutchen came forward and proposed that if they would take care of his family he would go. This the company agreed to. Mr. Stanton, a single man, volunteered, if they would furnish him a horse. Mr. McCutchen, having a horse and a mule, generously gave the mule. Taking their blankets and provisions they started for California. I have forgotten to ask you for a copy of the list of those who have to pay for my mules, etc. which you has been so kind to make out; I wish you would have the goodness to send me a copy by the first opportunity, and you will oblige me very much. Some one must go on to Sutters Fort after provisions. A call was made for volunteers. C.T. Stanton and Wm. McCutchen bravely offered their services and started on bearing letters from the company to Captain Sutter asking for relief. 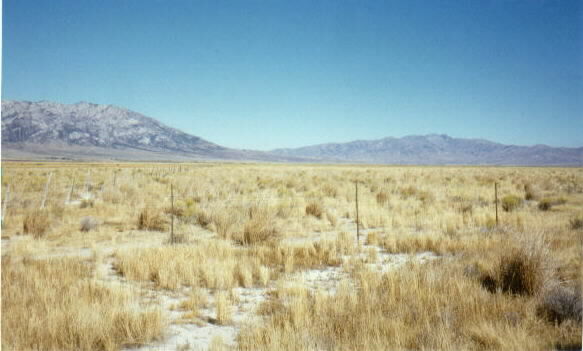 Some accounts have Stanton and McCutchen leaving while the party recruited from the dry drive across the Salt Desert, such as John Breens account published in 1856 in Eliza Farnhams California In-doors and Out : While we laid here, two men were sent on, on horseback, to California, to get provisions, and return to meet us on the Humboldt. A disagreeable altercation took place between two members of our party about a very trivial matter in dispute, but threatening fatal consequences. Under the excitement of angry emotions, rifles were leveled and the clock of the locks, ... was heard. ... It was truly a startling spectacle, to witness two men, in this remote desert, surrounded by innumerable dangers, ... so excited by their passions as to seek each others destruction. 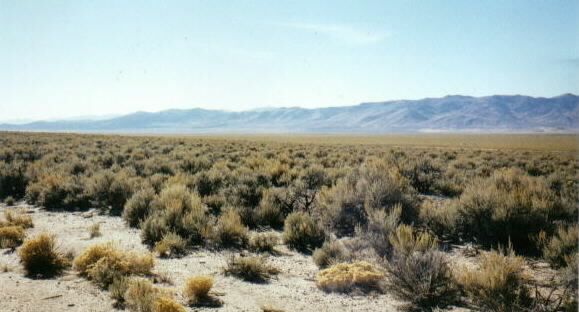 From this valley, the Donner Party could have traveled two days north along the east side of the East Humboldt Range, over relatively easy country (the route of present US Highway 93) directly to the wells at the head of the Humboldt River (outside present Wells, Nevada). However Hastings, like the Bartleson Party five years earlier, was unaware of this route. Instead, Hastings led the Harlan-Young wagons south to find a pass around the mountains. The Donner Party had no choice but to follow. 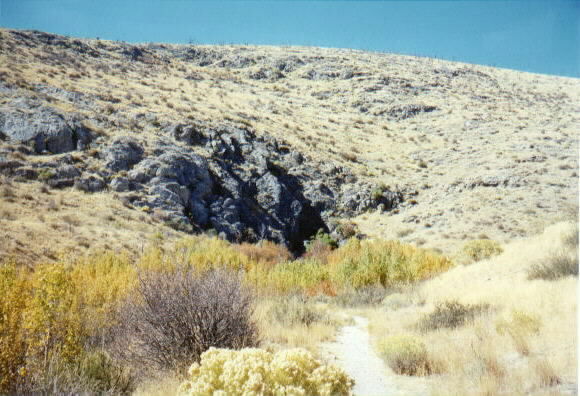 To the north of this camp was a steep, narrow pass through the Ruby Mountains, now called Secret Pass. Hastings had crossed this pass on his pack-train journey east from California the previous Spring. But the pass was too difficult for wagons, and Hastings had led the Harlan-Young wagons south in Ruby Valley towards a lower pass. The Donners followed. 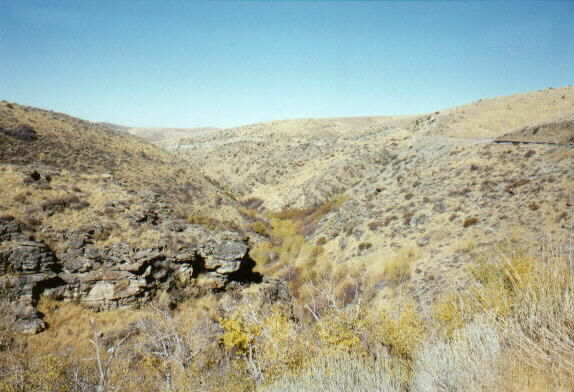 During their journey south through the Ruby Valley, as noted by Thornton, They proceeded down this valley three days, making about fifty miles of travel. The new road, or Hastings Cut-off, leaves the Fort Hall road here, and is said to be a saving of 350 or 400 miles ... and a better route. The rest of the Californians went the long route--feeling afraid of Hastings Cut-off. Which really was the long route? On July 20, the Donner Party had made their initial decision to take the Cut-off. At the Little Sandy River in Wyoming, they passed Greenwoods cut-off to the Bear River, the most direct route to Fort Hall. Eleven days later, they passed up their last chance to take the old Fort Hall road from Bridgers Fort. 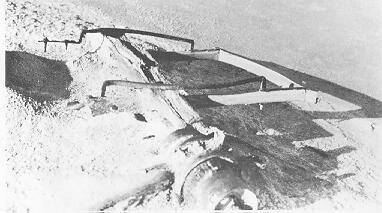 Sixty-eight days after leaving the Little Sandy, they completed the Hastings Cut-off. And what of those who went the long route? Four days ahead of the Donner Party at the Little Sandy, the Cooper-Gregg Party took the Fort Hall road. According to Nicholas Carigers diary, they reached the Little Sandy on July 16, and the South Fork of Marys River thirty-seven days later on August 22. By comparison, the first wagon party across the Trail in 1846, the Craig and Stanley Party, took thirty-five days (from July 1 to August 5) according to diarist William E. Taylor. Those who followed Hastings and Hudspeth down the Weber River Canyon and across the Salt Desert were faster than the Donner Party, but still slower than the Fort Hall parties. Map maker T.H. 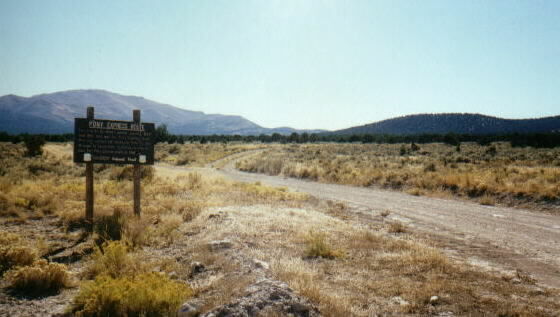 Jefferson reached the Little Sandy two days ahead of the Donner Party on July 18, and arrived at Marys River fifty-two days later on September 8. James Mathers, who was at the Little Sandy three days sooner on July 15, arrived at Marys River with Jefferson. At its best, the Hastings Cut-off was fifteen days slower than the Fort Hall road. The Donners were sixteen days slower than that, or a full month slower than the Fort Hall parties. Although Hastings had not found a viable short-cut in 1846, his geographic sense was ultimately proven correct. Along its entire 380 mile distance from Fort Bridger, Wyoming, to the Humboldt River below Elko, Nevada, the Cut-off is never more than 50 miles from the route of Interstate 80, the fastest and most direct route across the central US today. Had Hastings not rounded the Ruby Mountains, but instead discovered the pass on the east side of the Humboldt Range direct to the Wells (present Wells, Nevada), his cut-off would be within 20 miles of Interstate 80 its entire distance. About 11 oclock, an Indian, who spoke a little English, came to them, .... About 4 oclock, P.M., another came to them, who also spoke a little English. He frequently used the words jee, who, and huoy; thereby showing that he had been with previous emigrants. They traveled all that day, and at dark encamped at a spring about half way down the side of a mountain. A fire broke out in the grass, soon after the camp fires had been kindled, which would have consumed three of the wagons, but for the assistance of these two Indians. The Indians were fed, and after the evening meal they lay down by one of the fires, but rose in the night, stealing a fine shirt and a yoke of oxen from Mr. Graves.